The story is both fact and fiction. Fiction because we are not sure of the past our two horses experienced before coming to us. 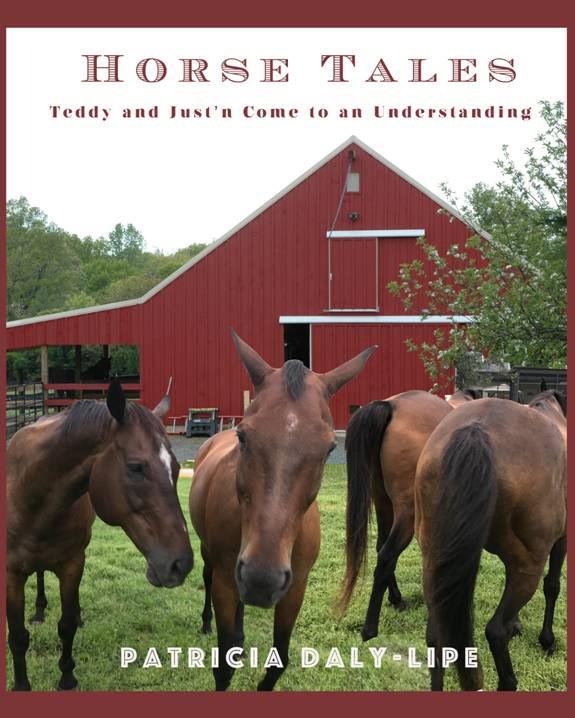 The facts: these two thoroughbreds, Teddy and Just’n, live with the author and her husband and the tales they tell are true experiences, perhaps not all theirs, but incidences which have been observed and experienced by the author. $12.99 + S&H from Amazon or other book seller. The first settlers to arrive here in 1869 purchased 160 acres for two dollars and change. La Jolla attracted artists, architects, writers and scientists over the years, contributing to today’s prized reputation as a valuable world-class destination. Their stories shaped the fascinating history of this seaside village. Pirates and smugglers hid out in Sunny Jim’s Cave. Ellen Browning Scripps, the Godmother of La Jolla, founded institutions and recreation areas for not only La Jollans but also the rest of the world, including Scripps Institutution of Oceanography. Theodor Seuss Geisel derived inspiration for his art from La Jolla’s landscapes and people. 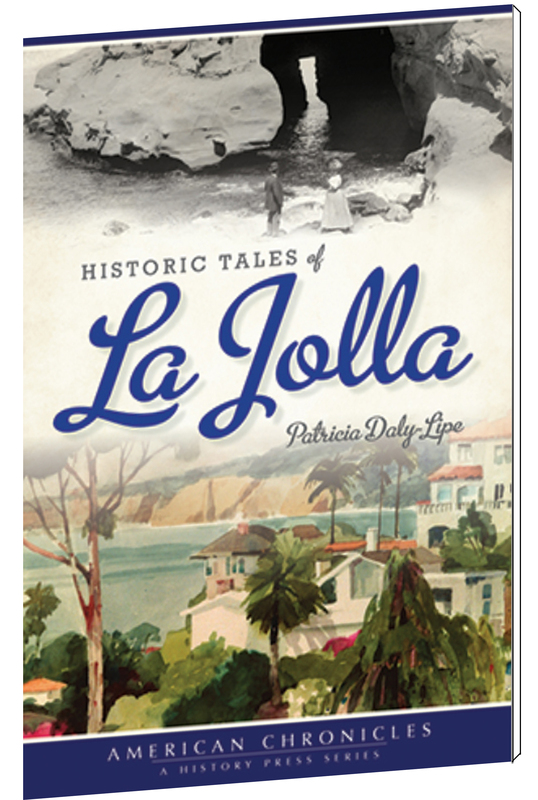 Native La Jollan Patricia Daly-Lipe recalls the stories of these and many other people and places that have molded the village of La Jolla into a natural and cultural wonder. 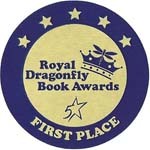 A CRUEL CALM; Paris Between the Wars won First Place in the 2013 Royal Dragonfly Book Awards for Historical Fiction. "Better to have loved and lost than never to have loved at all -well, yes and no. Read A CRUEL CALM's view of this age old dilemma." and two time Emmy nominee. "The historian can learn much from the novelist." A Historian who garnered numerous honors, including two Pulitzer Prizes, two Bancroft Prizes, and the Presidential Medal of Freedom). The first Edition, titled Forbidden Loves, Paris Between the Wars, won first runner-up in the category of fiction in the 3rd Annual International Print on Demand, "JADA Book of the Year" Awards contest. "[The arts are] bound to inspire imagination and creativity and awaken in scores of young people a yearning and talent many don't know resides in them." Myth, Magic & Metaphor, A Journey into the Heart of Creativity attempts to awaken the aesthetic sense, the creative muse who lurks within us all. Today, in a cognitive/technical society, people have become more and more removed from the instinctive aspect of the psyche. My task as author is to enhance the creative spirit through myth and metaphor, to restore the sense of wonder adults experienced as children. My method is multi-sensory, interdisciplinary, and holistic. There are no limitations to what thoughts, ideas, observations, or research could and might be used to stimulate the creative process. The ultimate tool is the human heart. The medium is words. Philosophy, art, music, and linguistics are some of the disciplines used as stimulation. As Phyllis Whitney said, learn to "think with a pencil." What comes out on paper may be the most wonderful gift you have ever received. And, just think, dear reader, you gave it to yourself! 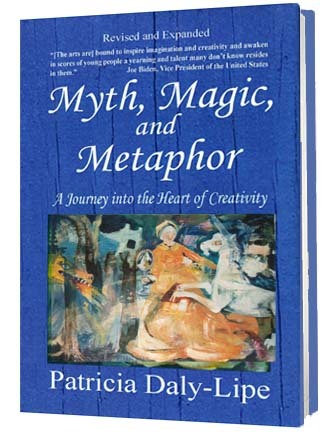 Before writing Myth, Magic and Metaphor as a book, Patricia taught a class by the same name both at Maryland Hall for the Creative Arts in Annapolis and at Anne Arundel Community College, Continuing Education. The following is one of the many letters forwarded to Patricia. It reflects the same attributes taught in the course as are found in the book. In the latter case: to make the reader into a writer. "I would like to take this opportunity to express my feeleings about a course I recently attended (Myth and Magic / Pat Daly, Advanced Writers Workshop). "I would also to express my gratitude to the instructor. I entered Ms. Daly's course as a 'Literary Snob', but I left with a new appreciation for the written word. Prior to attending this course, it had been twenty years since I had opened a book with Hemingway, Joyce, or Faulkner on the cover. After attenting Ms. Daly's first session, I found myself racing to the library in search of these authors. Ms. Daly reintroduced me to a world that I had long forgotten. She provided stimulation, inspiration, and a desire to catch up on all I had missed. "For me, more inportant than the rediscovery of other authors was the writer I discovered inside myself through Ms. Daly's class exercises. These exercises taught me a new way of writing. "The only complaint I have about the course is that it was far too short. There was so much more we could have covered." . . .
or by sending me an email $14.95. Whoever said all history is biography got it right. 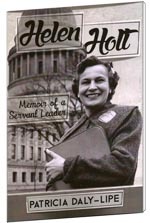 Reading about and listening to the stories of Helen Holt has shared not only helps clarify some historical issues, but should help the current generation learn from the past to improve the future. Issues like integrity in politics, the merits of education, aid for the elderly and so much more absorbed Helen's time. It is my hope this book about this special lady will serve to enhance those values for our readers. "[Helen has] not only witnessed some of Nations most defining moments but [she has] also helped to make them ... [Her] life represents a part of the American Story." "Brave patriots like [Helen] have made it possible to raise our families and pursue our dreams in the greatest	nation	on	earth." PATRIOT PRIEST tells one man's personal experience over several epochs and areas of history. 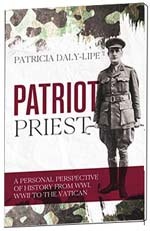 It is also in part, the story of one unique individual, author Patricia Daly-Lipe's great uncle Msgr. William A. Hemmick. Born in Pittsburgh, PA, and raised in Europe, he became fluent in five languages. When the first World War broke out, he felt committed to help the troops. After the war, he was proclaimed the Patriot Priest of Picardy by the Army and Navy. After years spent in Paris, William Hemmick was asked by the Vatican to come to Rome. Ultimately, he became the only American Canon of St. Peter's Representing the Knights of Malta to the Holy See. It was he who performed the nuptials of American film star Tyrone Power and Linda Christian. He also converted the future Queen Astrid of Belgium. Although, many stories and famous people permeate Hemmick's life through the events of both world wars, this is not only the story of one individual. It is a personal glimpse at an epic era in history, from WWI to Paris between the wars, to WWII and its aftermath. "Universe to each must be all that is, including me." 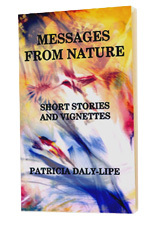 Messages from Nature is a collection of short stories about animals, trials at sea, and ‘the evolutionary journey of man and nature. It is a book for all ages. Based on my personal experiences, most of the stories were previously published in newspapers and magazines over the years. Also included is one poignant tale about a greyhound written by my late father, Daly Highleyman, and published in the 1930s. How would it feel to be on a small sailboat far from land in gale force winds or suddenly subjected to a micro-burst? Are horses psychic? What was it like to be up at the helm of a 165-foot concrete schooner and, looking down the steps, see water gushing into the cabin? Did Sweet William come back to say goodbye? How can a puppy found starving to death in the Virginia countryside become a master sailor? Explore and discover the answers to these questions and more in Messages from Nature. Progress is being made all over the world, the so-called progress named technology. But another avenue of progress is also being made all over the world and that is the progress of research in the field of creativity. It cannot be ignored that the creative endeavor has a spiritual side to it. Nor can it be said that creative work results from technical know-how. Inspiration is a key factor and its roots may not be as nebulous as they first appear. Genuine creative imagination does not just spring from the right hemisphere of the brain. I believe its roots come from a much deeper place: the heart. In this vein, it is my hope that this little tome will inspire the reader to feel and react to the beauty of nature and the love of animals; in effect, to experience the invaluable life lessons that only Nature can teach. If you are a horse lover like me, you will enjoy the following: click here. *You can view your eBook file by opening the file with any eBook reader capable of reading an .epub file. 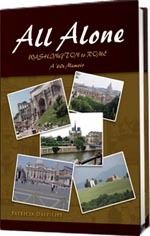 If you do not have an eBook reader that is compatible with an .epub file you can download a free reader from the internet called “Adobe Digital Editions” at http://www.adobe.com/products/digitaleditions. Look for and press the “Launch” button to download the reader to your computer. "All history properly understood is the history of thought." My history (herstory) is based upon diary entries written during the late ‘50s and ‘60s. But memories tend to change with age. Time softens some, sharpens others, distorts and even extracts parts. This fabric of our memories, its threads weaving intermittently in and out of the realm of recall, is not quite the same as it was almost 50 years ago. Yet it is nonetheless the fabric from which my life was woven.. The French have an expression: the more things change, the more they remain the same. Remembering and researching for this memoir led me to that conclusion as well. twenty something living in Europe. Was that really me? Was Paris/Rome/Belgium/London really like that in the ‘60s? Yes, it is real. Real because I wrote it on the spot. No directives, no hindsight. Now I have integrated all those direct observations into a Memoir. It is for you, dear reader, to enjoy and, at the same time, perhaps gain some appreciation for the past. In this case, my past. La Jolla, A Celebration of Its Past was the winner or the San Diego Book Awards Association for the year 2002. 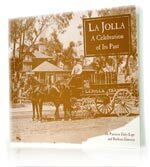 La Jolla, A Celebration of Its Past is a rich and varied collection of vignettes and essays about historic La Jolla. Since this author believes that "history is someone else’s point of view", the emphasis is on the extraordinary people who helped build and shape this special place. La Jolla is more than a town, more than just a pretty seaside place in the sun. There is a spirit about this place. The essence of La Jolla comes not only from the sea, the surf, the sun, the cliffs, and the caves, but also from its unique and bountiful history which includes very special citizens. or by sending me an email $19.95.